Back when I was in high school, my favorite comic books series was New Mutants. I had a mail subscription to the series because we didn’t have a comic shop in my small East Texas town at the time. Cannonball was a character I could relate to: tall, gangly, goofy looking, unsure of himself, and Southern. I really liked that when he “blasted” into the air he could only fly straight. Turning was his weakness. It was fun to watch this character mature, learn how to control his mutant abilities (i.e. turn! ), and grow into a leader. Glad to have him back leading his fellow New Mutants again. 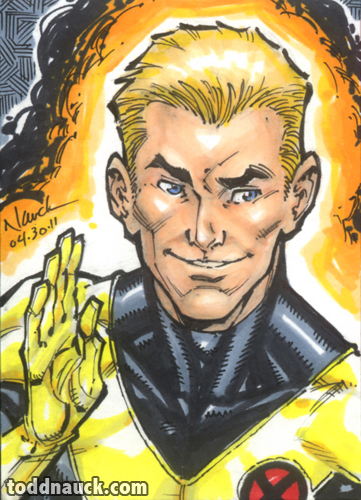 This entry was posted in Marvel, Sketch Cards and tagged cannonball, copic, marvel, new mutants, sketch card, superhero, x-men by Todd Nauck. Bookmark the permalink. I imagine that you had the same problem finding comics in East Texas as I did finding them in West Texas at the time. Thank god for the supermarket spinner rack.